COVER REVEAL for A HUMAN ELEMENT! 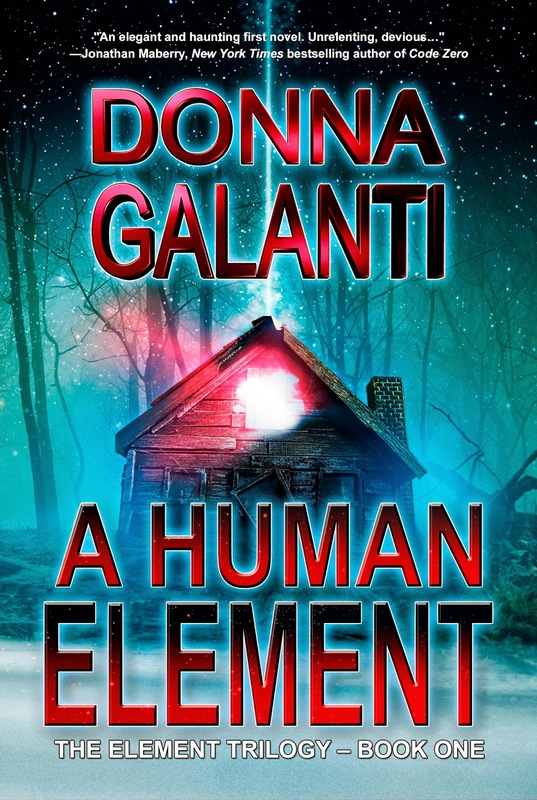 Feast your eyes on this epic creepy cover for A HUMAN ELEMENT – book 1 in Donna Galanti’s Element Trilogy! This paranormal suspense officially hits shelves July 28th! Get your dark on with murder and mystery with a dash of steam. Join Donna’s Facebook Launch Party 7/28 from 4-9pm EDT here for cool guests + giveaways! PLUS there’s more feasting to be done with this awesome giveaway jam-packed with prizes! Enter A HUMAN ELEMENT Release Giveaway now! Felix ran from the cabin toward the trail down. "Come on!" Ben followed close behind, panic hitting him. Why did Laura leave? They were here to help defend her. Damn her! He never should have left her alone. "Felix, why didn't you see this happening?" Ben grabbed the back of Felix's coat and lunged at him. Felix turned on one heel and swung his arm out, holding Ben off like a child. Ben struggled to break free. "What the hell is wrong with you? Why didn't you stop her? She's gonna die. I need to protect her." "This is the only way, Ben. Trust me." "She's the one person I've cared about in a long, long time. Please, don't let her die." Felix released him. "I don't intend to. Now come on." Felix turned away and ran fast down the trail. His massive body moved nimble over the rugged ground. He looked like a giant, dark beast lunging toward its prey. Ben could only run after him. There was nothing else he could do. They hadn't run far when a deafening blast pushed them to the ground. The cabin exploded behind them in flames. Fire devoured old wood and metal, dancing upward toward the sky. The heat grabbed at them with fiery intensity. Ben could feel it burning his face and hands. "Laura," he whispered, stunned by the violence aimed at them. Their enemy was real. And he was here. Felix and Ben turned and both ran faster down the mountain, lunging down the trail, grabbing branches to push themselves along. Felix had to be right. Please, let Felix be right. Donna Galanti writes murder and mystery with a dash of steam as well as middle grade adventure fiction. She is an International Thriller Writers Debut Author of the paranormal suspense novel A Human Element, A Hidden Element (August 2014), the short story collection The Dark Inside, and Joshua and The Lightning Road (Books 1 and 2, 2015). She’s lived from England as a child, to Hawaii as a U.S. Navy photographer. She now lives in Pennsylvania with her family in an old farmhouse. It has lots of writing nooks, fireplaces, and stink bugs, but she’s still wishing for a castle again—preferably with ghosts. Mary, thanks so much for having me on and sharing the cover of A Human Element! Awesome cover. I love the color and content.